During a visit to the aircraft carrier that bears his name, first lady Melania Trump gave the 41st president the ultimate tribute with a viral selfie aboard a Navy plane. The picture her featured her in the official hat of the aircraft carrier, which was first commissioned in 2009. The flight itself was a historic first, according to The Associated Press: It’s the first time a first lady has ever taken flight in a V-22 Osprey, a tiltrotor aircraft that takes off vertically like a helicopter but rotates its engines to fly like a plane once it’s in the air. She posted a video of herself aboard the Osprey on her Twitter account. Do you think Melania Trump is a good first lady? “First ladies usually don’t take solo helicopter rides. When they do travel by helicopter, they often are accompanying the president aboard Marine One, a more traditional aircraft,” the AP reported. 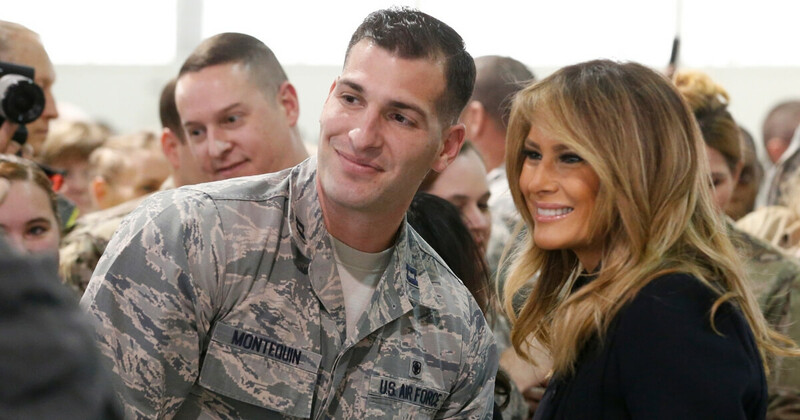 The first lady visited a pair of military bases on Thursday — Joint Base Anacostia-Bolling in Washington, D.C. and Joint Base Langley-Eustice in Hampton, Virginia — as well as the carrier.